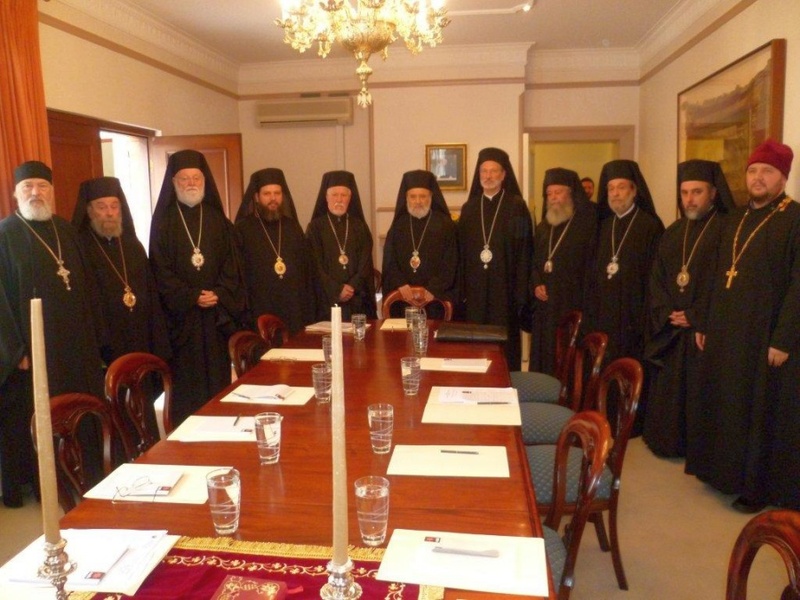 The members of the 2nd Episcopal Assembly of all canonical Orthodox Bishops of Oceania welcomed once again the opportunity to meet in Sydney from October 16-17, 2011, under the chairmanship ex officio of His Eminence Archbishop Stylianos of Australia. The Assembly commenced with prayer at the central offices of the Greek Orthodox Archdiocese of Australia, Redfern. Present were: His Eminence Archbishop Stylianos (Ecumenical Patriarchate – Australia), His Eminence Metropolitan Paul (Antiochian Patriarchate), His Grace Bishop Irinej (Serbian Church), His Grace Bishop Mihail (Romanian Church), His Eminence Metropolitan Amphilochios (Ecumenical Patriarchate – New Zealand), His Grace Bishop Ezekiel (Assistant Bishop), His Grace Bishop Seraphim (Assistant Bishop), His Grace Bishop Nikandros (Assistant Bishop), His Grace Bishop Iakovos (Assistant Bishop), the Very Rev. Father Michael Protopopov (representing His Eminence Metropolitan Hilarion of the Russian Orthodox Church) who read a letter of greeting from His Eminence Metropolitan Hilarion) and Rev. Father Michael Smolynec (representing His Eminence Archbishop Ioan of Parnassou of the Ukrainian Orthodox Church in the Diaspora). The Bishops continued the work of the first Assembly, held in Sydney in October last year, and heard the Reports of the respective Committees. 6. To bring together prominent Orthodox theologians, medical doctors, psychologists, ethicists, legal and public policy experts to enable the Hierarchs of Oceania to issue responsible joint statements with regard to the ethical dimensions of proposed Government legislation. The Assembly received a Report on the draft Act of Parliament for the recognition of all canonical Orthodox Churches in New Zealand, and specifically with regard to the registration of Marriage Celebrants. Another Report was received from the Committee on Campus Ministry, which met under the co-Chairmanship of His Grace Bishop Irinej and His Grace Bishop Ezekiel, the primary focus of which was to develop Orthodox Chaplaincy in tertiary educational institutions. The Assembly confirmed the proposal of the Committee to appoint His Grace Bishop Iakovos of Miletoupolis to Chair the Committee. The Assembly reaffirms its unity in our Lord Jesus Christ, and in brotherly love, committing ourselves to work together for the good of the holy Orthodox Church and its children in Australia and throughout Oceania.